Can you believe we have seen the end of 2018 already? We have been in the middle of this capital campaign, called Phase 2, for over 2 years and each year we see more support, more donations, and more love for our vision. We can’t wait to share Phase 2 with you – and we are getting closer everyday. So, let’s talk about 2018! 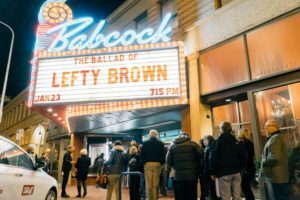 We started out the year doing some pretty fun things, including hosting The Ballad of Lefty Brown at the Babcock and enjoying the company of Bill Pullman and his lovely wife, Tamara. We held some events like the Oscars VIP event and 3 Course Conversation. Then we took over management of the Babcock and reopened it as a first fun, big budget film theater! Earlier in the year, we were offered a $200,000 pledge from Singh Contracting. We were challenged by Singh to RAISE the $200,000 before the pledge would be fulfilled. Not only did they give us the whole year of 2018 to raise it, but in November, the challenge was extended until the end of February 2019. By the end of 2018, we raised a total of $175,000! We are overwhelmed with gratitude and excitement. With only $25,000 to go and 2 EXTRA months to raise it, we are confident that we will meet our goals and hit that $200,000! Since launching our Phase 2 Capital Campaign, we have raised $910,000 and we couldn’t have done it without you, our amazing supporters and donors. We are looking forward to 2019 and to bringing Phase 2 to you. We have grants to write, events to plan, and some Phase 2 planning to do! Here we are, almost to October, and we at Art House are excited to share what we have been up to regarding Phase 2! In June, we announced that Singh Contracting has pledged to MATCH all 2018 donations up to $200,000, and we have seen some amazing support! So far this year, we have raised $65,000! We have raised 1/3 of our goal!! While that is AWESOME, we have a ways to go! So, if you haven’t joined the #SinghChallenge, we hope you do! It’s easy, and we even offer monthly recurring donations, so you don’t even have to think about it! Head to http://www.arthousebillings.com and click DONATE! On top of our #SinghChallenge, we have an amazing event coming up that you NEED to be part of! It’s called 3 Course Conversation and we are honored to have three talented chefs each offering a delicious course, paired with wine from George’s Distributing and short film! Tickets are $65 each and we are only offering 60!!! And they are flying out the door, so make sure to get yours today! Over the course of the next month, we will converting all of our donor info and our giving portal to a new system! We are very excited for the improved experience we as a staff, as well as you, the customer/donor will receive! But that means that if you are a MONTHLY DONOR, we will need to get you set up with our new system and cancel your current recurring donation. You will receive information via email about this, so be on the look out! WHEW!! That was a lot, but we have SO much going on! This was just the Phase 2 stuff….as you know we have a lot coming up with holiday entertainment and the Babcock! Keep watching our Facebook and website for events and new info! 0 Have you joined the #SinghChallenge? One month into the Singh Challenge and we are “Singhing” praises to all our amazing supporters!! In June, we announced that Singh Contracting has pledged $200,000 towards our Phase 2 project! We are overwhelmed with gratitude! Here’s the deal though….we need to raise $200,000 in 2018 before we receive this generous donation. So we asked you, Billings, to help! We are so very thankful! We have a road ahead of us, but we are getting there all because of you! Please consider giving at this exciting time and help make Phase 2 happen faster! Thank you for joining the Art House Story, we are honored to have you! Be now you may have heard our exciting news….but if you haven’t (and because we can’t stop saying it)…. SINGH CONTRACTING HAS PLEDGED $200,000 TO PHASE 2!! We are overwhelmed with gratitude and excitement! Singh Contracting would like to see us RAISE $200,000 before we receive the pledge. We can do that, right? With your help, YES we can! Every dollar we raise for Phase 2 in 2018 will be matched! And you might be thinking….but it’s almost July….so does that mean what I think it means?? We have a $40,000 head start! That’s right, we have raised over $40,000 so far this year! While that is great headway, we still have more to go. So we are asking YOU to help! Will you join the Singh Challenge and give? Simply click HERE and fill our our simple and safe form. *If you want to learn more about Phase 2 and why it’s such a big deal for our amazing city, especially downtown, click HERE and we’ll show you. A huge THANK YOU to Singh Contracting for your generosity and support of the Art House vision. Thank you to the Billings Gazette for sharing our story! 0 What’s been going on around Art House? We have had a great first few months around here! 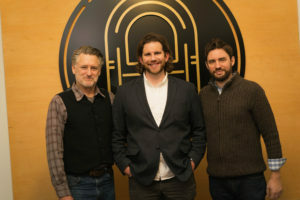 We started off our year with a fabulous event at the Babcock with Mr. Bill Pullman and Mr. Jared Moshe. We partied like film stars at our VIP Oscars Event in early March and most recently celebrated our 3rd Birthday!! Our Phase 2 capital campaign is still in full swing. We are working our way through grant proposals and busy planning out what the rest of 2018 will look like. To date we have raised $140,000 in donation gifts, $200,000 in pledges, and $350,000 through TIF funding. That is a total of $690,000! We are so excited and so grateful to all of our supporters. We hope to see even more donors and monthly donors, business supporters, and grant funds come in throughout this year in order to break ground on construction early next year! So, be on the look out for some fabulous pint aide events at local breweries, unique events at Art House, and some other surprise events! 2018 is shaping up to be a great year! *For more information on how you can go to the movies for free and get on the guest list for our VIP events, head HERE! *To give to PHASE 2, just click HERE! 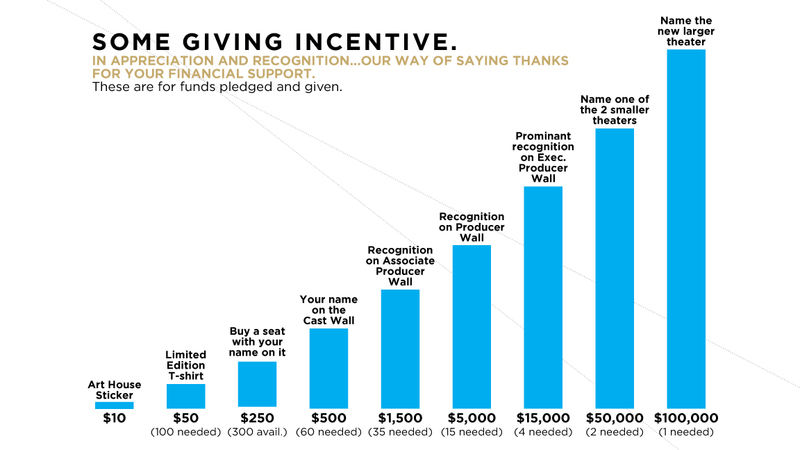 Remember, your donations are tax deductible and we have some awesome incentives for you – our way of saying thank you for your donation to your local-independent-nonprofit-film theater! Thank you Billings for watching films, becoming members, giving gifts, and partying with us! 0 In case you missed the news…. Here at Art House, we wanted to start 2018 with a BANG…and that’s just what we did. If you were able to join us for our special event at The Historic Babcock Theater on January 23, 2018, you’re probably still telling your friends about it. Mr. Pullman, as well as the Director of the film, Jared Moshe. The Ballad of Lefty Brown was filmed right here in Montana. We are so grateful that 700 of you were able to join us for this event at the Babcock. 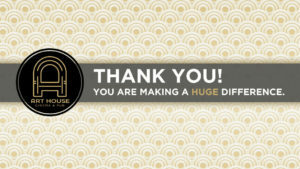 Thank you, Billings, for continuing to show your support of Art House Cinema & Pub! 0 THANK YOU BILLINGS!! 2017 was amazing! To all of you who were able to give to the Phase 2 project in 2017, you made a HUGE difference! We had a great year. We watched films, listened to music, drank beer and wine, snacked on Swedish Fish and popcorn….and raised a ton of money. You guys, we are blown away! *We raised over $90,000 in donations alone over the course of 2017! *$55,000 of those donations were made in November and December 2017 alone! *32 of those people are giving monthly! *Since launching the Phase 2 Capital Campaign, we have taken in nearly $125,000 in donations alone! WOW!!! Billings, you are incredible! Since launching our campaign in the fall of 2016, we have also been rewarded $350,000 in TIF funds and received a very generous pledge of $200,000! So…that means we have raised $675,000 for Phase 2 so far! We are overwhelmed with gratitude for our many amazing supporters. Whether you were able to give monetarily or by becoming a member of the theater, or by telling your friends about Art House, sharing our Facebook post, seeing a film here and there, devouring our delicious popcorn, sipping our wine, or chugging our beer…..WE ARE THANKFUL. Billings, you make us feel all the feels. As we continue on our Phase 2 journey, let’s here from Corby! He is a art and film lover, a believer in downtown and a supporter of Art House. Thanks Corby for your love and support! If you want to join Corby and the many other Art House donors, please click DONATE in the upper right hand corner of this page. Thanks! You might already know Art House. You come for films or you plan to soon. You might have already heard about our Phase 2 project. But why is it all important? There are dozens of reasons why we think you should join the Art House/Phase 2 story. But we figure, why should we do all the talking? This is the fabulous Judy. She is a film lover, an Art House volunteer and a monthly Phase 2 donor. We love her enthusiasm and her passion for great things for Billings! Thanks Judy! You’ve heard of Art House. You’ve heard about our Phase 2 project. You come for films or you plan to soon. But why is it all important? There are dozens of reasons why we think you should join the Art House/Phase 2 story. But we figure, why should we do all the talking? Today we are going to hear from Sam. He is a film lover, a downtown supporter, and an Art House donor.